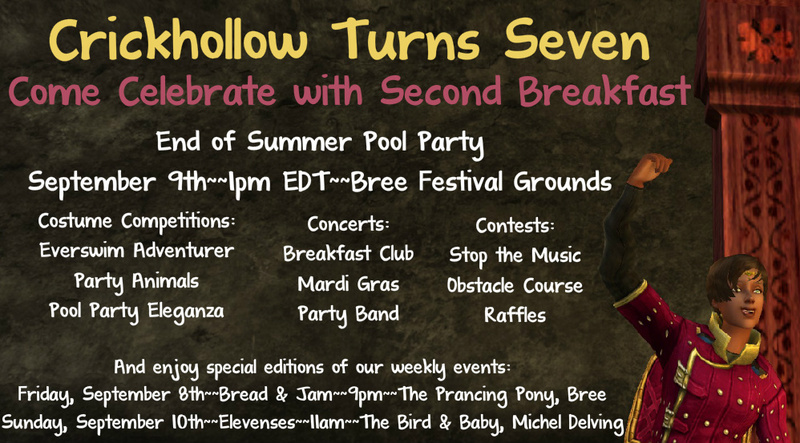 Crickhollow, Second Breakfast, and Elevenses are celebrating their 7th anniversaries the weekend of September 8th-10th. We welcome you to join us for special editions of our regular weekly events, as well as a Saturday pool party featuring contests, music, and raffles. Bread & Jam showcases some of Crickhollow's best bands and greatest storytellers every week. We will also be holding some raffles throughout the day. The after party includes a swim in the Everclear Lakes and a round robin musical jam. This twice weekly event has showcased solo/small group music and light RP since the day the server opened. Best of luck on a great event! Happy Birthday, Crickhollow! The server had its soft open on September 8, 2010. I checked out the server, joined Second Breakfast, and had my first Elevenses that day. It was the best decision I've made in many years playing this game. 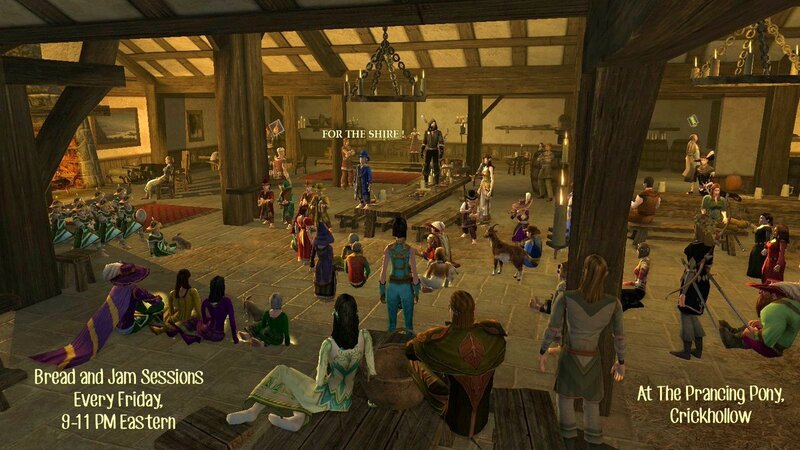 Second Breakfast holds events throughout the year and we are very happy to invite all of the LOTRO Community to the celebration of this milestone. It all starts tonight at Bread & Jam, 9pm EDT/server time at the Prancing Pony as it is each Friday night. 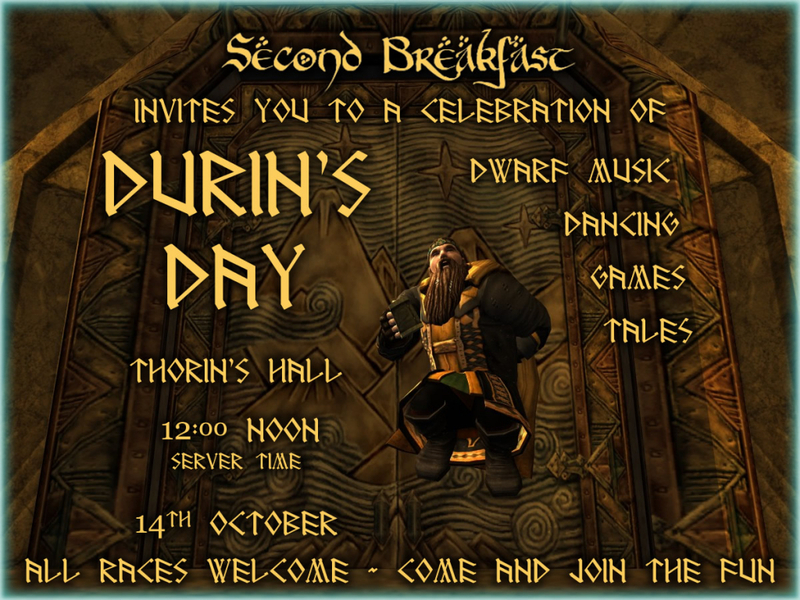 The Durin's Day celebration will be our next event. Come this weekend, come for Elevenses, Bread & Jam, and/or Midweek Tunes & Ales every week (find more details in my signature), and put Durin's Day on your calendar because you will not want to miss our next major event. We'll have details for you soon! Until then, please come celebrate the anniversary with us this weekend. 500 LOTRO points are up for grabs during each cosmetic competition and the obstacle course. Raffles will give away special items all day. We hope you won't miss this special day!